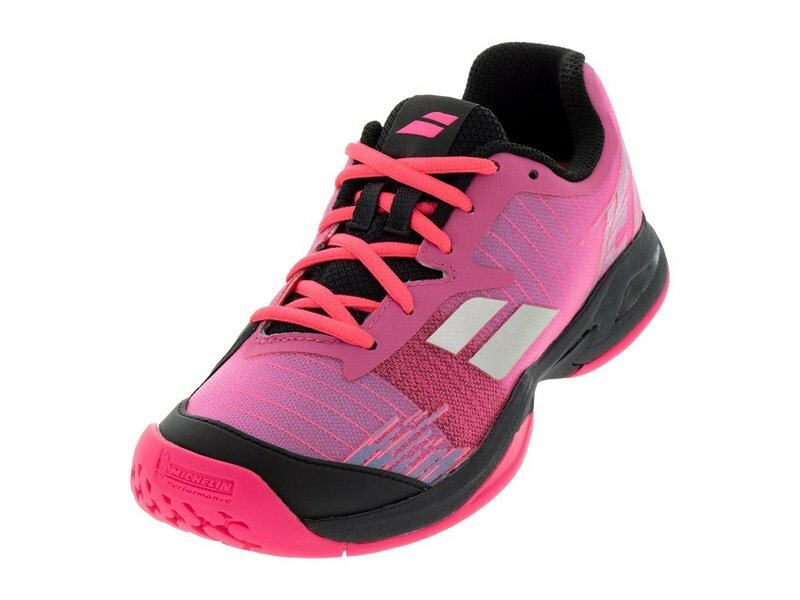 These kids Babolat Jet All Court junior tennis shoes (pink, black) are lightweight, breathable and comfortable. Babolat's Junior Jet All Court Tennis Shoes in blue and black are extremely lightweight, breathable and comfortable. These shoes are based off of the adult Jet line and carry many similar features and technologies. Upper: Matryx fabric combines Kevlar and Polyamide fibers for a durable, lightweight and breathable upper. Insole: A dual-layered Ergo-Motion insole and Ortholite memory-shape technology gives any kid excellent comfort. Midsole: The EVA midsole is soft and responsive. The Kompressor heel, midsole, unit adds excellent shock absorption to keep feet feeling fresh. 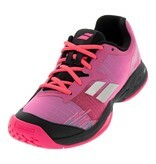 Outsole: The highly durable Michelin outsole offers excellent traction on any court surface.